Yesterday morning, on a whim, I checked to see what interesting historical events had taken place on that particular date. After reading the names of those noteworthy enough to have their births and deaths recorded, I learned that July 17, 1897 was the beginning of the Klondike Gold Rush. Also known as the Yukon, or Alaska Gold Rush, this event happened less than a year after a massive quantity of gold was discovered in the Klondike region of the Yukon in August of 1896. When the news eventually reached Seattle and San Francisco, it triggered a stampede of would-be prospectors to the area, all eager to find their fortunes. In keeping with history, today's blog is about gold, a dense, shiny metal (that most women love!) ~ a chemical element with the symbol Au and the atomic number 79. Gold karat, known as K or kt (represented by ct, or carat, in some other countries) is the gold content of the metal. Pure gold, or 24K, is a deep yellow color, but it is too soft to be used for most types of jewelry. It is therefore alloyed with other metals, which changes the hardness, color and other properties, as well as the affordability. When pure gold is non-alloyed, it is 100% gold and is called 24K. When mixed with other metals, pure gold becomes 18K (75% pure gold), 14K (58.5% ) or 10K (41.7%). 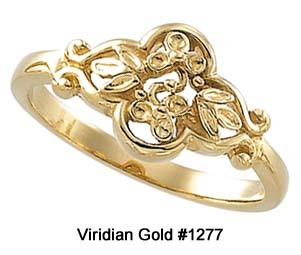 Most jewelry is stamped with a marking to show the type of gold: 10K or 417, 14K or 585, 18K or 750. Alloy metals used to make 18, 14 and 10K yellow gold are usually copper and silver. Rose, or pink gold, contains more copper. Other relatively new colors are green gold, which is created by adjusting the amount of copper and silver, and blue, which is alloyed with iron. White gold contains white metals, such as silver and palladium, as well as aluminum, zinc and copper. See our Rose of Sharon Wedding Bands #1518, pictured on the right, for examples of multiple gold colors. 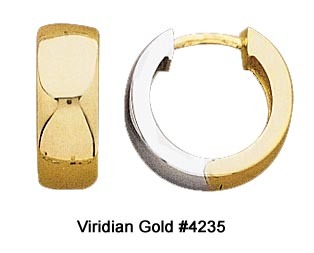 When two gold colors are used in a single piece of jewelry, it is called "Two-Tone" gold, usually yellow and white, such as the Two-Tone Gold Huggie Earrings #4235 pictured on the left. As a side note, some jewelers and websites carry items that are labeled "two-tone" that are actually yellow gold with rhodium plating. Rhodium is a member of the platinum family and is actually whiter and harder than platinum. 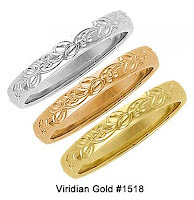 It is occasionally used to plate, or coat, yellow gold, giving the item a two-tone appearance. (It is also used to plate white gold to give a more durable finish; and is sometimes used to plate sterling silver to prevent tarnishing.) 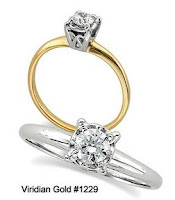 Be sure to look for the word "gold" after a two-tone description if you are looking for a piece of jewelry that is composed of both yellow and white gold. "Tri-Color" gold simply means that there are three colors of gold in the same jewelry item (usually yellow, white and rose), as in our "Tender Touch" Diamond Heart Pendant #5005. 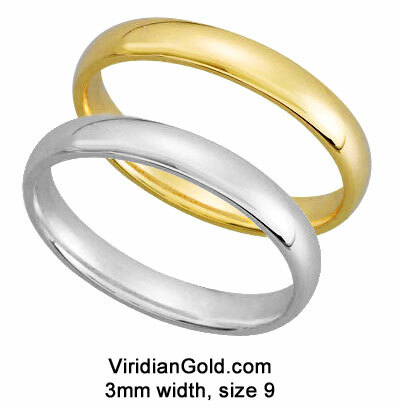 Again, look for the word "gold" rather than "plated", as yellow gold can be plated to give a tri-color effect. 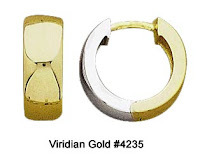 Whichever ever color you like, be assured that the gold jewelry you purchase from Viridian Gold is solid gold. Any items that have plating as accents are clearly labeled as such. In addition, all of our jewelry is marked with its fineness (10, 14 or 18K), which is your assurance of quality.